We went to the market on Sunday morning, just to look around and walk. 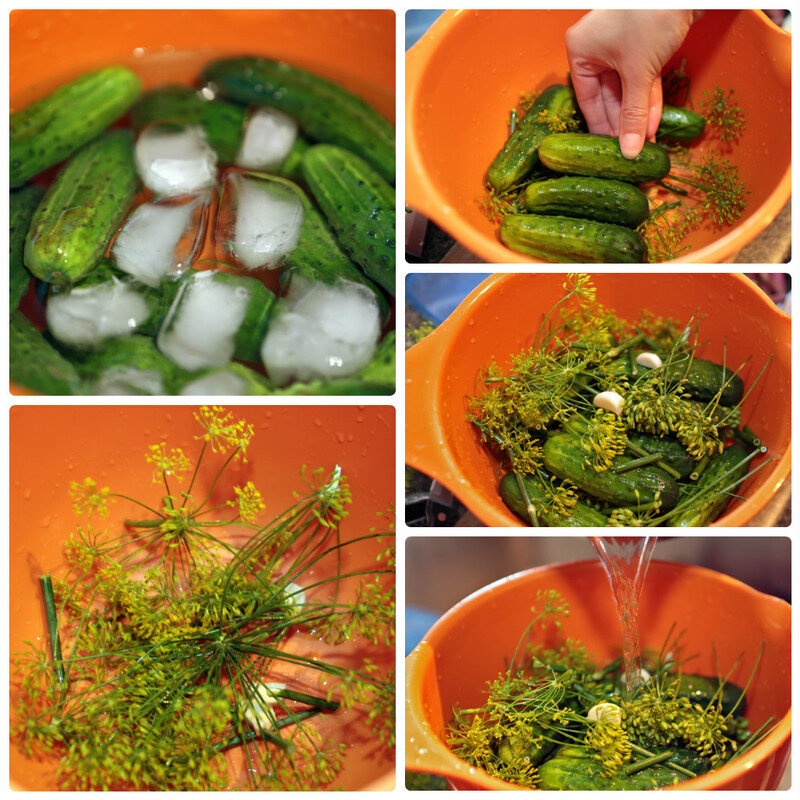 I find it very relaxing and then we decided to buy mini cucumbers for pickling.I don´t know why they call them dill pickles because they are not dill pickles yet 🙂 Do you know what I mean? So now I´m confused and don´t know how to call them…. 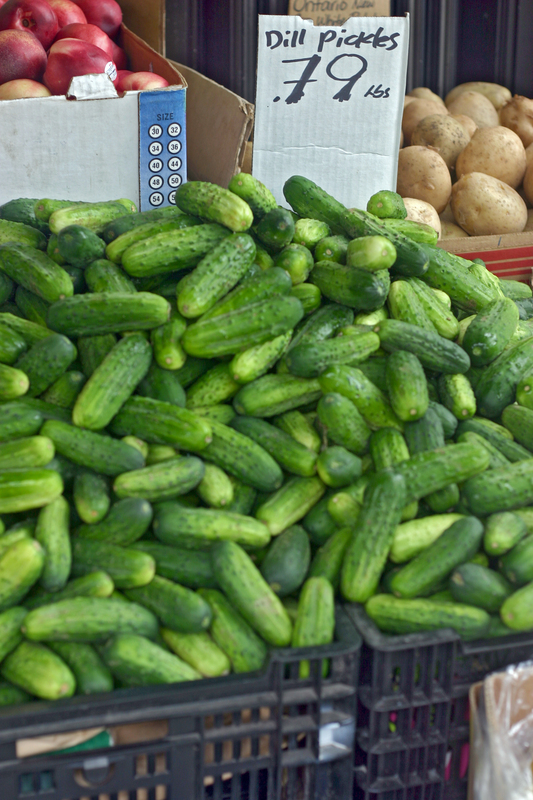 I haven´t pickled mini cucumbers here, in Canada, yet, but we used to all the time back home in Estonia. And here it was in front of me – dill plant cuttings. I remembered from my childhood that I also need garlic and horseradish. We also add black currant bush leaves but here nobody sells these leaves. I decided to try without the leaves. Later I read I could substitute black currant leaves with cherry or oak leaves. But I decided not to. Now I have a plan to grow a bush in our apartment 🙂 I just need seeds…now where would I get the seeds…. Because I wasn’t sure if they would turn out good, I only bought a little bit of the pickling cucumbers. First you need to soak your mini cucumbers in ice-cold water, it is necessary because then they don´t get soggy after pickling and stay nice and crisp! Suggested time is 2-6 hours but I was inpatient and only did it for 2 hours. 1. Cut the flower parts from the stem. Cut the stems into 2,5 cm pieces. 2. 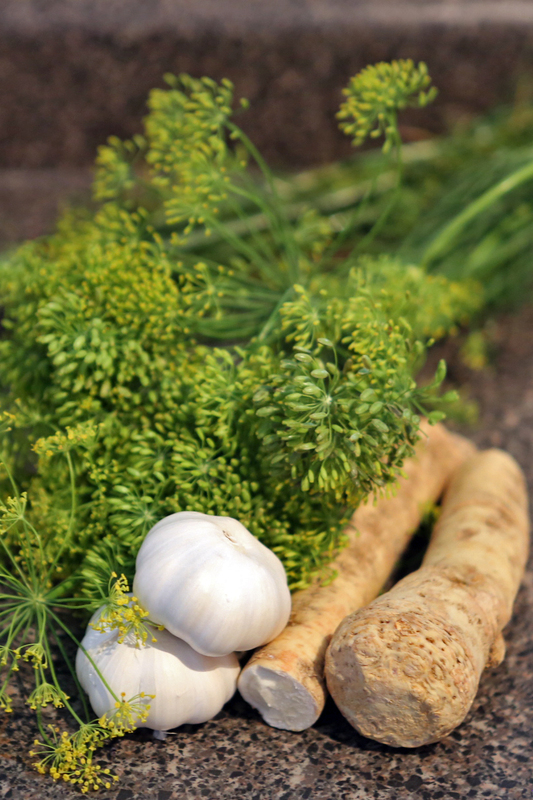 Cut 3 0,5 cm slices of horseradish and set aside 2 garlic cloves. 3. Warm up 2 litres of water with 80 g of salt. Set aside. Water doesn’t need to be hot, just enough to melt the salt. When I poured the water on top of the cucumbers, it was 135 F.
4. Start layering everything, starting from dill plants. When done, add water, so everything will be under the water. Cover the bowl with a plate and a glass of water or something heavy. 5. Set aside for at least 12 hours. We tasted the first one after 12 hours, because I couldn’t wait much longer 🙂 It was already awesome, I like the mild dill pickles. Just as tasty as I remember making them with my mom when I was younger. For a moment I felt I was 10 again and stealing the “early” pickles from the bucket 🙂 Usually they are ready in 12-24 hours. After getting the desired taste on the pickles, put them in the fridge, so they won´t go bad. If you want to store, put them in a air tight jar. Now I can go back to the market and get a lot more of these pickling cucumbers. Interesting, I didn’t know about the ice! Do you find that dill doesn’t have the same taste in Canada than it does in Estonia? The French and Finnish dill certainly aren’t the same! I didn’t find it was with a different taste in the finished product….interesting. I think I have been away quite some time that I don’t think I would tell the difference any more unless I had something to compare it to. Yeah I only noticed it again this summer in Finland! I buy dried dill in Russian stores here because I think it is closest to the taste I am used to. Hi! I’m wondering how many jars of pickles your recipe is for? I tried following it once already and in the conversion, I ended up with way too much salt! Hi Krista, thanks for stopping by…I actually did not jar them, I ate them all before I could actually jar them. I used 2 liters of water and there was about 13 cucumbers, I would say 2 jars (1 liter)! Did the pickles tasted too salty or the water? The water should always taste a little too salty when you pour it on top of them. It doesn´t mean the pickles will be that salty, they will not take in all that saltiness….did that all make sense? 🙂 Or just try a bit less salt next time….